“For there is nothing covered, that shall not be revealed; and hid, that shall , not be known “–Matt, x.26. And feeling desirous that others may be made acquainted with the same truths, and led to examine the subject carefully for themselves, that they may discern between truth and error, and light and darkness, and receive the one and reject the other, we are induced to undertake the publication of this work. Before leaving this part of the subject, we wish to correct the public in relation to the people that call themselves “Mormons,” now located at the great salt Lake, with Brigham Young as their leader, they are not members of the Church of Jesus Christ of Latter Day Saints, they have been regularly tried and expelled from said Church, for their wicked, licentious, and depraved conduct, and are no way connected with the Church of Latter Day Saints directly or indirectly, but God has declared by prophesy and revelation through his servant, James J. Strang, that they shall be cursed, and utterly wasted and destroyed for their abomination, corrupt, and wicked deeds, ever so, Amen. mind, viz.–that all the religious denominations were believing in incorrect doctrines; and consequently, that none of them was acknowledged of God, as his church and kingdom. And he was expressly commanded to go not after them; and he received a promise that the true doctrine the fulness of the gospel, should, at some future time, be made known to him; after which, the vision withdrew, leaving his mind in a state of calmness and peace, indescribable. Some time after having received this glorious manifestation, being young, he was again entangled in the vanities of the world, of which he afterwards sincerely and truly repented. This glorious being declared himself to be an Angel of God, sent forth, by commandment, to communicate to him that his sins were forgiven, and that his prayers were heard; and also, to bring the joyful tidings, that the covenant which God made with ancient Israel concerning their posterity, was at hand to be fulfilled; that the great preparatory work for the second coming of the Messiah, was speedily to commence; that the time was at hand for the gospel in its fulness, to be preached in power to all nations, that a people might be prepared with faith and righteousness, for the Millennial reign of universal peace and joy. mandment of God, to one of the last prophets among them,) were safely deposited, to preserve them from the hands of the wicked, who sought to destroy them. He was informed, that these records contained many sacred revelations pertaining to the gospel of the kingdom, as well as prophecies relating to the great events of the last days; and that to fulfil his promises to the ancients, who wrote the records, and to accomplish his purposes, in the restitution of their children, &c. they were to come forth to the knowledge of the people. If faithful, he was to be the instrument, who should be thus highly favored in bringing these sacred things to light; at the same time, being expressly informed, that it must be done with an eye single to the glory of God, that no one could be entrusted with those sacred writings, who should endeavor to aggrandize himself, by converting sacred things to unrighteous and speculative purposes. After giving him many instructions concerning things past and to come, which would be foreign to our purpose to mention here, he disappeared, and the light and glory of God withdrew, leaving his mind in perfect peace, while a calmness and serenity indescribable pervaded the soul. But, before morning, the vision was twice renewed, instructing him further, and still further, concerning the great work of God, about to be performed on the earth. In the morning he went out to his labor as usual; but soon the vision was renewed–the Angel again appeared; and having been informed by the previous visions of the night, concerning the place where those records were deposited, he was instructed to go immediately and view them. Accordingly, he repaired to the place, a brief description of which shall be given, in the words of a gentleman, by the name of Oliver Cowdery, who has visited the spot. county, to Canadaigua, Ontario county, New York, before arriving at the little village of Manchester, say from three to four, or about four miles from Palmyra, you pass a large hill on the east side of the road.–Why I say large, is because it is as large, perhaps, as any in that country. “The north end rises quite suddenly until it assumes a level with the more southerly extremity; and I think I may say, an elevation higher than at the south, a short distance, say half or three-fourths of a mile. As you pass towards Canadaigua, it lessens gradually until the surface assumes its common level, or is broken by other smaller hills or ridges, water courses and ravines. I think I am justified in saying, that this is the highest hill for some distance round, and I am certain that its appearance, as it rises so suddenly from a plain on the north, must attract the notice of the traveller as he passes by.”–“The north end,” which has been described as rising suddenly from the plain, forms “a promontory without timber, but covered with grass. As you pass to the south, you soon come to scattering timber, the surface having been cleared by art or wind, and a short distance further left, you are surrounded with the common forest of the country. It is necessary to observe, that even the part cleared, was only occupied for pasturage; its steep ascent, and narrow summit not admitting the plough of the husbandman, with any degree of ease or profit. It was at the second mentioned place, where the record was found to be deposited, on the west side of the hill, not far from the top down its side; and when myself visited the place in the year 1830, there were several trees standing enough to cause a shade in summer, but not so much as to prevent the surface being covered with grass-which was also the case when the record was first found. Although many more instructions were given by the mouth of the angel to Mr. Smith, which we do not write in this book, yet the most important items are contained in the foregoing relation. During the period of the four following years, he frequently received instruction from the mouth of the heavenly messenger. And on the morning of September 22, A.D. 1827, the angel of the Lord delivered the records into his hands. In the mean time, the inhabitants of that vicinity, having been informed that Mr. Smith had seen heavenly visions, and that he had discovered sacred records, began to ridicule and mock at those things. And after having obtained the records, while proceeding home through the wilderness and fields, he was waylaid by two ruffians, who had secreted themselves for the purpose of robbing him of the same. One of them struck him with a club before he perceived them; but being a strong man, and large in stature, with great exertion he cleared himself from them, and ran towards home, being closely pursued until he came near his father’s house, when his pursuers, for fear of being detected, turned and fled. idea, that he should surely obtain the plates; after searching very diligently, he was sadly disappointed at not finding them. Mr. Smith then drove on, but before he got to his journey’s end, he was again overtaken by an officer on the same business, and after ransacking the wagon very carefully, he went his way, as much chagrined as the first, at not being able to discover the object of his research. Without any further molestation, he pursued his journey until he came to the northern part of Pennsylvania, near the Susquehanna river, in which part his father-in-law resided. Having provided himself with a home, he commenced translating the record, by the gift and power of God, through the means of the Urim and Thummim; and being a poor writer, he was under the necessity of employing a scribe, to write the translation as it came from his mouth. In the mean time, a few of the original characters were accurately transcribed and translated by Mr. Smith, which, with the translation, were taken by a gentleman by the name of Martin Harris, to the city of New York, where they were presented to a learned gentleman, by the name of Anthon, who professed to be well acquainted with many languages, both ancient and modern. He examined them; but was unable to decipher them correctly; but he presumed that if the original records could be brought, he could assist in translating them. But to return. Mr. Smith continued the work of translation, as his pecuniary circumstances would permit, until he finished the unsealed part of the records. The part translated is entitled the “Book of Mormon,” which contains nearly as much reading as the Old Testament. We learn from this very ancient history, that at the confusion of languages, when the Lord scattered the people upon all the face of the earth, the Jaredites, being a righteous people, obtained favor in the sight of the Lord, and were not confounded. And because of their righteousness, the Lord miraculously led them from the tower to the great ocean, where they were commanded to build vessels, in which they were marvellously brought across the great deep to the shores of North America. Accordingly, in process of time, they became a very numerous and powerful people, occupying principally North America; building large cities in all quarters of the land; being a civilized and enlightened nation. Agriculture and machinery were carried on to a great extent. Commercial and manufacturing business flourished on every hand; yet in consequence of wickedness, they were often visited with terrible judgments. Many prophets were raised up among them from generation to generation, who testified against the wickedness of the people, and prophecied of judgments and calamities which awaited them if they did not repent, &c. Sometimes they were visited by pestilence and plagues, and sometimes by famine and war, until at length (having occupied the land some 1500 or 1600 years,) their wickedness became so great that the Lord threatened, by the mouth of his prophets, to utterly destroy them from the face of the land. But they gave no heed to these warnings; therefore the word of the Lord was fulfilled; and they were entirely destroyed; leaving their houses, their cities, and their land desolate; and their sacred records also, which were kept on gold plates, were left by one of their last prophets, whose name was Ether, in such a situation, that they were discovered by the remnant of Joseph, who soon afterwards were brought from Jerusalem to inherit the land. brought across the great Pacific Ocean, and landed upon the western coast of South America. In the eleventh year of the reign of Zedekiah, at the time the Jews were carried away captive into Babylon, another remnant were brought out of Jerusalem, some of whom were descendants of Judah. They landed in North America, soon after which they emigrated into the northern parts of South America, at which place they were discovered by the remnant of Joseph, something like four hundred years after. From these ancient records, we learn that this remnant of Joseph, soon after they landed, separated themselves into two distinct nations. This division was caused by a certain portion of them being greatly persecuted, .because of their righteousness, by the remainder. The persecuted nation emigrated towards the northern parts of South America, leaving the wicked nation in possession of the middle and southern parts of the same. The former were called Nephites, being led by a prophet whose name was Nephi. The latter were called Lamanites, being led by a very wicked man, whose name was Laman. The Nephites had in their possession a copy of the Holy Scriptures, viz. the five books of Moses, and the prophecies of the holy prophets down to Jeremiah, in whose days they left Jerusalem. These scriptures were engraved on plates of brass, in the Egyptain language. They themselves also made plates, soon after their landing, on which they began to engrave their own history, prophecies, visions, and revelations. All these sacred records were kept by holy and righteous men, who were inspired by the Holy Ghost; and were carefully preserved and handed down from generation to generation. tion of their obedience to his commandments; but if they were disobedient they should be cut off from his presence. And the Nephites began to prosper in the land, according to their righteousness, and multiplied and spread forth to the east, west and north; building large villages, cities, synagogues, and temples, together with forts, towers, and fortifications, to defend themselves against their enemies. And they cultivated the earth, and raised various kinds of grain in abundance. They also raised numerous flocks of domestic animals, and became a very wealthy people; having in abundance gold, silver, copper, tin, iron, &c. Arts and sciences flourished to a great extent. Various kinds of machinery were in use. Cloths of various kinds were manufactured. Swords, scimitars, axes, and various implements of war were made, together with headshields, arm-shields, and breastplates, to defend themselves in battle with their enemies. And in the days of their righteousness, they were a civilized, enlightened and happy people. heaps upon the face of the ground, and covered with a shallow covering of earth, which will satisfactorily account for those ancient mounds filled with human bones, so numerous at the present day, both in North and South America. The second colony, which left Jerusalem eleven years after the remnant of Joseph left that city, landed in North America, and emigrated from thence to the northern parts of South America; and about four hundred years after, they were discovered by the Nephites, as we stated in the foregoing. served by the latter. Numerous prophets were raised up from time to time throughout their generations. Many records, both historical and prophetical, which were of great size, were kept among them; some on plates of gold and other metals, and some on other materials. The sacred records, also of the more ancient race who had been destroyed, were found by them. These were engraved on plates of gold. They translated them into their own language, by the gift and power of God, through the means of the Urim and Thummim. They contained an historical account from the creation down to the tower of Babel, and from the time down until they were destroyed, comprising a period of about thirty-four hundred or thirty-five hundred years. They also contained many prophecies, great and marvellous, reaching forward to the final end and consummation of all things, and the creation of the new heaven and new earth. The prophets also among the Nephites prophesied of great things. They opened the secrets of futurity; saw the coming of Messiah in the flesh-prophesied of the blessings to come upon their descendants in the latter times–made known the history of unborn generations–unfolded the great events of ages to come–viewed the power, glory, and majesty of Messiah’s second advent–beheld the establishment of the kingdom of peace gazed upon the glories of the day of righteousness-saw creation redeemed from the curse, and all the righteous filled with songs of everlasting joy. Christ, they were visited in great judgment. Thick darkness covered the whole continent. The earth was terribly convulsed. The rocks were rent into broken fragments, and afterwards found in seams and cracks upon all the face of the land. Mountains were sunk into valleys, and valleys raised into mountains. The highways and level roads were broken up and spoiled. Many cities were laid in ruins. Others were buried up in the depths of the earth, and mountains occupied their place. While others were sunk, and waters came up in their stead, and others still were buried by fire from heaven. Thus, the predictions of their prophets were fulfilled upon their heads. Thus, the more wicked part, both of the Nephites and Lamanites were destroyed. Thus, the Almighty executed vengeance and fury upon them, that the blood of the saints and prophets might no longer cry from the ground against them. when all people, nations, and languages shall stand before God to be judged, and the heaven, and the earth should pass away, and there should be a new heaven and new earth. These teachings of Jesus were engraved upon plates, some of which are contained in the book of Mormon; but the greater part are not revealed in that book, but are hereafter to be made manifest to the saints. After Jesus had finished ministering unto them, he ascended into heaven; and the twelve disciples whom he had chosen, went forth upon all the face of the land, preaching the gospel; baptizing those who repented, for the remission of sins, after which they laid their hands upon them, that they might receive the Holy Spirit. Mighty miracles were wrought by them, and also by many of the church. The Nephites and Lamanites were all converted unto the Lord, both in South and North America; and they dwelt in righteousness above three hundred years; but towards the close of the fourth century of the Christian era, they had so far apostatized from God, that he suffered great judgments to fall upon them. The Lamanites, at that time, dwelt in South America, and the Nephites in North America. female–the aged, middle-aged, and children. Hundreds of thousands were slain on both sides; and the nation of the Nephites were destroyed, excepting a few who had deserted over to the Lamanites, and a few who escaped into the south country, and a few who fell wounded, and were left by the Lamanites on the field of battle for dead, among whom were Mormon and his son Moroni, who were righteous men. Mormon had made an abridgement, from the records of his forefathers, upon plates, which abridgement he entitled the “Book of Mormon,” and, (being commanded of God,) he hid up in the hill Cumorah, all the sacred records of his forefathers which were in his possession, except the abridgement called the “Book of Mormon,” which he gave to his son Moroni to finish. Moroni survived his nation a few years, and continued the writings, in which he informs us, that the Lamanites hunted those few Nephites who escaped the great and tremendous battle of Cumorah, until they were all destroyed, excepting those who were mingled with the Lamanites, and that he was left alone, and kept himself hid, for they sought to destroy every Nephite who would not deny Christ. He furthermore states, that the Lamanites were at war one with another, and that the whole face of the land was one continual scene of murdering, robbing, and plundering. He continued the history until the four-hundred and twentieth year of the Christian era; when, (by the commandment of God,) he hid up the records in the hill Cumorah, where they remained concealed, until by the ministry of an angel they were discovered to Mr. Smith, who, by the gift and power of God, translated them into the English language, by the means of the Urim and Thummim, as stated in the foregoing. “Be it known unto all nations, kindreds, tongues, and people, unto whom this work shall come, that we, through the grace of God the Father, and our Lord Jesus Christ, have seen the plates which contain this record, which is a record of the people of Nephi, and also of the Lamanites, their brethren, and also of the people of Jared, who came from the tower of which hath been spoken; and we also know that they have been translated by the gift and power of God, for his voice hath declared it unto us; wherefore, we know of a surety, that the work is true. And we also testify that we have seen the engravings which are upon the plates and they have been shown unto us by the power of God, and not of man. And we declare with words of soberness, that an angel of God came down from heaven, and he brought and laid before our eyes, that we beheld and saw the plates, and the engravings thereon; and we know that it is by the grace of God the Father, and our Lord Jesus Christ, that we beheld and bear record that these things are true; and it is marvellous in our eyes, nevertheless, the voice of the Lord commanded us that we should bear record of it; wherefore, to be obedient to the commandments of God, we bear testimony of these things. And we know that if we are faithful in Christ, we shall rid our garments of the blood of all men, and be found spotless before the judgement seat of Christ and shall dwell with him eternally in the heavens. And the honour be to the Father, and to the Son, and to the Holy Ghost, which is one God. Amen. which we have seen: and we lie not; God bearing witness of it. Also, in the year 1829, Mr. Smith and Mr. Cowdery, having learned the correct mode of baptism, from the teachings of the Savior to the ancient Nephites, as recorded in the “Book of Mormon,” had a desire to be baptized; but knowing that no one had authority to administer that sacred ordinance in any denomination, they were at a loss to know how the authority was to be restored, and while calling upon the Lord with a desire to be informed upon the subject, a holy angel appeared–stood before them–laid his hands upon their heads–ordained them–and commanded them to baptize each other, which they accordingly did. In the year 1830, a large edition of the “Book of Mormon” first appeared in print. And as some began to peruse its sacred pages, the spirit of the Lord bore record to them that it was true, and they were obedient to its requirements, by coming forth, humbly repenting before the Lord, and being immersed in water, for the remission of sins, after which, by the commandment of God, hands were laid upon them in the name of the Lord, for the gift of the Holy Spirit. and although they were the weak things of the earth, yet they were strengthened by the Holy Ghost, and gave forth their testimony in great power, by which means many were brought to repentance, and came forward with broken hearts and contrite spirits, and were immersed in water confessing their sins, and were filled with the Holy Ghost by the laying on of hands; and saw visions and prophesied. Devils were cast out, and the sick were healed by the prayer of faith, and laying on of hands. Thus was the word confirmed unto the faithful by signs following. Thus the Lord raised up witnesses, to bear testimony of his name, and lay the foundation of his kingdom in the last days. And thus the hearts of the saints were comforted and filled with great joy. In the foregoing, we have related the most important facts concerning the visions and the ministry of the angel to Mr. Smith; the discovery of the records; their translation into the English language, and the witnesses raised up to bear testimony of the same; we have also stated when, and by whom they were written; that they contain the history of nearly one half of the globe, from the earliest ages after the flood, until the beginning of the fifth century of the Christian era; that this history is interspersed with many important prophecies, which unfold the great events of the last days, and that in it also is recorded the gospel in its fulness and plainness, as it was revealed by the personal ministry of Christ to the ancient Nephites. We have also given an account of the restoration of the authority in these days, to administer in the ordinances of the gospel; and of the time of the organization of the church; and of the blessings poured out upon the same while yet in its infancy. We now proceed to give a sketch of the faith and doctrine of this Church. his Son, Jesus Christ, and in the Holy Ghost, who bears record of them, the same throughout all ages and for ever. We believe that all mankind by the transgression of their first parents, and not by their own sins, were brought under the curse and penalty of that transgression, which consigned them to an eternal banishment from the presence of God, and their bodies to an endless sleep in the dust, never more to rise, and their spirits to endless misery under the power of Satan; and that, in this awful condition, they were utterly lost and fallen, and had no power of their own to extricate themselves therefrom. fore, as by the offence of one, judgement came upon all men to condemnation; even so, by the righteousness of one, the free gift came upon all men unto the justification of life.” This is the reason why all men are redeemed from the grave. This is the reason that the spirits of all men are restored to their bodies. This is the reason that all men are redeemed from their first banishment, and restored into the presence of God, and this is the reason that the Saviour said, John xii. 32, “If I be lifted up from the earth I will draw all men unto me.” After this full, complete and universal redemption, restoration and salvation of the whole of Adam’s race, through the atonement of Jesus Christ, without faith, repentance, baptism or any other works, then all and every one of them, will enjoy eternal life and happiness, never more to be banished from the presence of God if they themselves have committed no sin: for the penalty of the original sin can have no more power over them at all, for Jesus hath destroyed its power–broken the bands of the first death–obtained the victory over the grave,–delivered all its captives, and restored them from their first banishment into the presence of his Father, hence eternal life will then be theirs, if they themselves are not found transgressors of some law. We believe that all mankind, in their infant state are incapable of knowing good and evil, and of obeying or disobeying a law, and that, therefore, there is no law given to them, and that where there is no law, there is no transgression; hence they are innocent, and if they should all die in their infant state, they would enjoy eternal life, not being transgressors themselves, neither accountable for Adam’s sin. and that a law is given against doing evil, and that the penalty affixed is a second banishment from the presence of God, both body and spirit, after they have been redeemed from the first banishment and restored into his presence. We believe that the penalty of this second law can have no effect upon persons who have not had the privilege, in this life, of becoming acquainted therewith; for although the light that is in them teaches them good and evil, yet that light does not teach them the law against doing evil, nor the penalty thereof. And although they have done things worthy of many stripes, yet the law cannot be brought to bear against them, and its penalty be inflicted, because they can plead ignorance thereof. Therefore they will be judged, not by the revealed law which they have been ignorant of, but by the law of their conscience, the penalty thereof being a few stripes. sentence of the law, then thou canst escape. If thou canst cause repentance, or baptism in water, or any of thine own works to atone for the least of thy transgressions, then thou canst deliver thyself from the awful penalty that awaits thee. But, be assured, O sinner, that thou canst not devise any way of thine own to escape, nor do anything that will atone for thy sins. Therefore, thy case is hopeless, unless God hath devised some way for thy deliverance; but do not let despair seize upon thee; for though thou art under the sentence of a broken law, and hast no power to atone for thy sins, and redeem thyself therefrom, yet there is hope in thy case; for he, who gave the law, has devised a way for thy deliverance. That same Jesus, who hath atoned for the original sin, and will redeem all mankind from the penalty thereof, hath also atoned for thy sins, and offereth salvation and deliverance to thee, on certain conditions to be complied with on thy part. We believe that the first condition to be complied with on the part of sinners, is, to believe in God, and in the sufferings and death of his Son Jesus Christ, to atone for the sins of the whole world, and in his resurrection and ascension on high, to appear in the presence of his Father, to make intercessions for the children of men, and in the Holy Ghost, which is given to all who obey the gospel. That the second condition is, to repent, that is, all who believe, according to the first condition, are required to come humbly before God, and confess their sins with a broken heart and contrite spirit, and turn away from them, and cease from all their evil deeds and make restitution to all whom they have in any way injured, as far as it is in their power. of Jesus Christ to baptize, otherwise it is illegal, and of no advantage, and not accepted by him; and that it is to be administered only to those persons, who believe and repent, according to the two preceding conditions. And that the fourth condition is, to receive the laying on of hands, in the name of Jesus Christ, for the gift of the Holy Ghost; and that this ordinance is to be administered by the apostles or elders, whom the Lord Jesus hath called and authorized to lay on hands, otherwise it is of no advantage, being illegal in the sight of God; and that it is to be administered only to those persons who believe, repent, and are baptized into this church, according to the three preceding conditions. These are the first conditions of the gospel. All who comply with them receive forgiveness of sins, and are made partakers of the Holy Ghost. Through these conditions, they become the adopted sons and daughters of God. Through this process, they are born again, first of water, and then of the spirit, and become children of the kingdom–heir of God–saints of the most High–the church of the first-born–the elect people, and heirs to a celestial inheritance, eternal in the presence of God. After complying with these principles, their names are enrolled in the book of the names of the righteous. word and spirit of Christ. “It is the duty and privilege of the saints thus organized upon the everlasting gospel, to believe in and enjoy, all the gifts, powers, and blessings which flow from the Holy Spirit. Such, for instance, as the gifts of revelation, prophecy, visions, the ministry of angels, healing the sick by the laying on of hands in the name of Jesus, the working of miracles, and, in short, all the gifts as mentioned in Scripture, or as enjoyed by the ancient saints.” We believe that inspired apostles and prophets, together with all the officers as mentioned in the New Testament, are necessary to be in the church in these days. We believe that there are a few sincere, honest, and humble persons, who are striving to do according to the best of their understanding; but, in many respects, they err in doctrine, because of false teachers and the precepts of men, and that they will receive the fulness of the gospel with gladness, as soon as they hear it. ministry of angels, and by the inspiration of the Holy Ghost, until the saints are guided into all truth, that is, until they come in possession of all the truth there is in existence, and are made perfect in knowledge. So long, therefore, as they are ignorant of any thing past, present, or to come, so long, we believe they will enjoy the gift of revelation. And when in their immortal and perfect state-when they enjoy “the measure of the stature of the fulness of Christ”–when they are made perfect in one, and become like their Saviour, then they will be in possession of all knowledge, wisdom, and intelligence: then all things will be theirs, whether principalities or powers, thrones or dominions; and, in short, then they will be filled with all the fulness of God. And what more can they learn? What more can they know? What more can they enjoy? Then they will no longer need revelation. We believe that wherever the people enjoy the religion of the New Testament, there they enjoy visions, revelations, the ministry of angels,& c. And that wherever these blessings cease to be enjoyed, there they also cease to enjoy the religion of the New Testament. We believe that God has raised up this church, in order to prepare a people for his second coming in the clouds of heaven, in power, and great glory; and that then the saints who are asleep in their graves will be raised, and reign with him on earth a thousand years. all governments, and the alarming wickedness of the present generation, have engraved UNIVERSAL JUDGEMENT, RUIN, and OVERTHROW upon all the kingdoms of this world. A dreadful storm is gathering in every region, and will, ere long, break forth with inconceivable fury upon this guilty generation. Already the fearful tempest begins to rage. The calm repose of ages is disturbed. Ancient and powerful monarchies which have stood the test of centuries, unmoved and unaltered, are now fast crumbling to ruin. Kingdoms are in terrible commotion, divided among themselves, and each distracted with internal broils, disorder, and confusion. The fountains of the nations seem to be broken up. The whole frame work of government is loosened and torn assunder. Every nation is alarmed and in consternation. Fearful forebodings have seized upon Politicians and Statesman, Kings and Rulers. All are perplexed with dreadful anxieties, looking after those things which are coming on the earth. In the midst of all these commotions, just as every government seems to be on the very eve of crumbling to pieces, and just as a thick cloud of judgement seems to hang frightfully over all nations, ready to burst with awful fury upon their guilty heads–a voice of mercy is heard. An angel is sent forth from the eternal worlds. Truth springs forth from the earth clothed with her native simplicity and beauty. Messengers are called of God, and sent forth with a proclamation to all people, requiring them to repent and obey the same. A way of safety for the meek of the earth is clearly pointed out. The kingdom of God is re-organized upon the earth, which alone will stand secure and triumphant in the midst of the dissolution of all earthly governments. by the church of Jesus Christ of Latter Day Saints-things which have already been embraced by many tens of thousands in our own native country. Thousands also among other nations are rejoicing in these tidings, having received this message with gladness. Never were mankind visited with a more important message than the one which has now saluted the ears of mortals. It is a message that deeply concerns all people, and calls for their most candid and sincere investigation. It is a message from the great Jehovah committed into the hands of mortals by holy angels sent forth from his presence. It is a message that will speedily penetrate the darkest corners of the earth, and enter into the palaces of Kings, while proud and haughty monarchs shall tremble at its power. It is a message which unveils the secrets of futurity, and draws aside the curtains which hide the destinies of all countries and governments. By the proclamation of this message, Judah shall be gathered from their long dispersion-the tribes of Israel be restored, with power and glory to their own lands-the remnant of Joseph, or the American Indians, become civilized and enlightened, and the Millennial reign of universal peace and joy be ushered in. tinue faithful to the end, they shall be saved. But woe unto them who hearken not to the message which God has now sent, for the day of vengeance and burning is at hand, and they shall not escape. Therefore, remember, O reader, and perish not! tection, but secretly for the express purpose to murder them. Murder them, for what purpose? say you. We answer, their purpose was to overthrow the Church of the Saints, to murder all the prophets, to kill them suddenly and leave the church without a prophet. Have they succeded? No! thank God, they have not succeeded, God ever mindful of his people had prepared for their martyrdom by the appointment of James J. Strang, and that agreeable to revelations given to the church more than twelve years before that time. — Let every honest man read the following incontrovertible truths, and then decide. Claims of James J. Strang to the first Presidency of the Church. Again, Sec. 14, Paragraphs 1 and 2:2 [2 RLDS 43: 1-2; UTAH 43: 1-7] “O hearken, ye elders of my curch and give ear to the words which I shall speak unto you: for behold verily, verily I say unto you, that ye have received a commandment for a law unto my church, through him whom I have appointed unto you, to receive commandments and revelations from my hand. And this ye shall know assuredly, that there is none other appointed unto you to receive commandments and revelations until he be taken, if he abide in me. From the above extract it is clearly shown that this appointment of successor will not only positively be made, but that it will come through Joseph and no other, and that God gave this particularly as a law unto the church. It is also clearly shown, that Joseph Smith was not to ordain, but to appoint, and that the ordination was, as God had told us before; namely, by the administration of an holy angel, and this revelation is given for the express purpose that we should not be deceived, and that we may know that any man or set of men who come before this church to lead and govern it in any other way or by any other order, are usurpers and imposters; and if we admit that Joseph Smith did not make this appointment of another, we admit that he was an impostor and a false prophet. It will be seen from this quotation, the duties and callings of the president of the Church of Latter Day Saints; and if we should find any one acting in the capacity of president to this church, without the gifts and blessings which God bestows upon the head of the church, then we may know that such person or persons are acting without authority, and consequently all their acts are void. count of more than one on the earth at the same time, holding the keys of mysteries and revelations which are sealed; and in eternity no one ever did or ever will want keys of mysteries of things sealed, for there “they see as they are seen, and know as they are known;” and all who are faithful and hold the priesthood of God, will become kings and priests of God, and reign on the earth, and consequently hold the keys of the kingdom, as one with Christ throughout eternity; therefore, he that hath ears to hear, let him hear what the spirit saith unto the Church. We now ask Has God fulfilled his promise by the mouth of his servant Joseph Smith? Read the following prophetic letter, and then answer. Letter of appointment from Joseph Smith to James J. Strang. 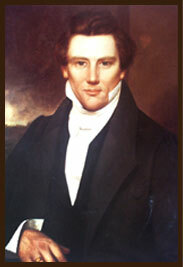 MY DEAR SON.–Your epistle of May 24th, proposing the planting of a stake of Zion in Wisconsin, and the gathering of the saints there, was duly received, and I with most of the brethren whose advice I called in, were of opinion that you was deceived by a spirit not of this world, great, but not good. Brother Hyrum however, thought otherwise, and favored the project, not doubting it was of God. I however determined to render you an unfavorable answer for the present. But oh the littleness of man in his best earthly state. Not so the will of the Almighty. God had ruled it otherwise, and a message from the throne of grace directed me as it hath inspired you, and the faith which thou hast in the Shepherd, the Stone of Israel, hath been repaid to thee a thousand fold, and thou shalt be like him; but the flock shall find rest with thee, and God shall reveal to thee his will concerning them. I have long felt that my present work was almost done, and that I should soon be called to rule a mighty host, but something whispers me it will be in the land of spirits, where the wicked cease from troubling, and the bands of the prisoners fall off. My heart yearns for my little ones, but I know God will be a Father to them, and I can claim face to face the fulfilment of promises from him who is a covenant keeping God, and who sweareth and faileth not to the uppermost. The wolves are upon the scent and I am waiting to be offered up, if such be the will of God, knowing that though my visage be more marred than that of any, it will be unscarred and fair when archangels shall place on my brow the double crown of martyr and king in a heavenly world. jah came upon me, and I went to enquire of God how the Church should be saved. I was upon the hill of the temple. The calm father of waters rolled below changeless and eternal. I beheld a light in the heavens above, and streams of bright light illuminated the firmament, varied and beautiful as the rainbow, gentle, yet rapid as the fierce lightning. The Almighty came from his throne of rest. He clothed himself with light as with a garment. He appeared; and moon and stars went out. The earth dissolved in space. I trod on air, and was borne on wings of Cherubims. The sweetest strains of heavenly music thrilled in my ear, but the notes were low and sad as though they sounded the requiem of martyred prophets. I bowed my head to the earth, and asked only wisdom and strength for the Church. The voice of God answered: My servant Joseph, thou hast been faithful over many things, and thy reward is glorious; the crown and sceptre are thine, and they wait thee. But thou hast sinned in some things, and thy punishment is very bitter. The whirlwind goeth before, and its clouds are dark, but rest followeth, and to its days there shall be no end. Study the words of the vision for it tarrieth not. And now behold my servant James J. Strang hath come to thee from far, for truth, when he knew it not, and hath not rejected it, but had faith in thee, the Shepherd and Stone of Israel, and to him shall the gathering of the people be; for he shall plant a stake of Zion in Wisconsin, and I will establish it; and there shall my people have peace and rest, and shall not be moved; for it shall be established on the prairie on White River, in the lands of Racine and Walworth; and behold my servants James and Aaron shall plant it, for I have given them wisdoni–and Daniel shall stand in his lot, on the hill beside the river looking on the prairie, and shall instruct my people, and shall plead with them face to face. Behold my servant James shall lengthen the cords and strengthen the stakes of Zion; and my servant Aaron shall be his counsellor, for he hath wisdom in the gospel, and understandeth the doctrines and erreth not therein. And I will have a house built unto me there of stone, and there will I show myself unto my people by many mighty works; and the name of the city shall be called Voree, which is being interpreted, garden of peace; for there shall my people have peace and rest, and wax fat and pleasant in the presence of their enemies. now the city of Voree shall be a strong hold of safety to my people, and they that are faithful and obey me I will there give them great prosperity, and such as they have not had before; and unto Voree shall be the gathering of my people, and there shall the oppressed flee for safety, and none shall hurt or molest them. And by this shall they know that I have spoken it; the people there and the owners of the land shall show kindness to them, for great calamities are coming on the church, and such as have not been; and if they scatter, the ungodly of the world shall swallow them up, but if they gather to my city of Voree, there will I keep them under the shadow of my wings, and the cities from whence my people have been driven shall be purged with a high hand, for I will do it; and my people shall be again restored to their possessions; but dark clouds are gathering, for the church is not yet wholly purged. And now I command my servants, the apostles and priests and elders of the church of the Saints, that they communicate and proclaim this my word to all the saints of God in all the world, that they may be gathered unto and round my city of Voree, and be saved from their enemies; for I will have a people to serve me. And I command my servant Moses Smith that he go unto the saints, with whom he is acquainted, and unto many people; and command them in my name to go unto my city of Voree and gain inheritance therein and he shall have an inheritance therein, for he hath left all for my sake, and I will add unto him many fold, if he is faithful; for he knows the land and can testify unto them that it is very good. This letter was received at Burlington, Wisconsin Territory, by regular course of mail, coming through the distributing office at Chicago; and bears the Nauvoo post mark of June 19, the day following its date. reached that part of the country. And be it known unto all the world that it was well understood at Nauvoo, that Mr. Strang had sent a letter to Joseph Smith, proposing the planting of Zion at Voree; and furthermore, all this took place in the very same month that Joseph Smith fell a martyr in the blood-stained walls of Carthage prison. The next question that presents itself to our minds is, did God confirm the foregoing appointment by the administration of an holy angel, according to his promise in the book of Doctrine and Covenants. Read the following extract from the church record at Voree, that was recorded at the time it was said to have occurred, and then decide. REVELATIONS GIVEN TO JAMES J. STRANG. Taken from the Records of the Church at Voree. On the 18th day of June, 1844, James J. Strang was in the Spirit, and he was in the grove above the stone quarry, on White River, and he had a vision; and behold he was carried away in the Spirit to the top of the hill, in the west border of Racine; and Gardner’s prairie was to the north, and the White River Marshes to the south; and he saw in the vision; and the lands round about were covered with many houses and gardens, and there were streets, and shops, and people; even a city of many inhabitants.–And the city was built of stone; and there were few houses of brick, and less of wood, and the gardens were many; and a few houses were very great, and their inhabitants many. There was a change in the vision, and the people with lively pace and smiling countenances thronged the streets and passed by. There was another change; and they were all assembled in a vast hall, and James J. Strang, surrounded by wise men, and counsellors, and priests, and eloquent orators, arose and taught the poeple; and the spirit of prophecy witnesseth unto him, so shall it be; and the vision ended; and he was strengthened, but his faith was weak. Fear God and be strengthened, and obey him, for great is the work which he hath required at thy hand. Go on in hope and strength, and falter not, and he will sustain thee, and thou shah triumph; for the voice of the Lord, by the mouth of Joseph, will he fulfil. him, and touched his head, and put oil upon him and said, Grace is poured upon thy lips, and God blesseth thee with the greatness of the everlasting Priesthood. He putteth might, and glory, and majesty upon thee; and in meekness, and truth, and righteousness, will he prosper thee. Thou shalt save his people from their enemies, when there is no arm to deliver and shalt bring salvation, when destruction walketh in the house of thy God. Thou hast loved righteousness and hated iniquity, therefore thy God hath anointed thee with oil and set thee above all thy fellows. Thy words shall be like sharp arrows in the heart of the wicked. Thou shalt rebuke those who pervert the word of thy God. Thou shalt preach righteousness and the sublime mysteries in the ears of many people, and shall bring the gospel to many who have not known it, and to the nations afar off. Thou shalt drive backward, and put to shame those that do evil, and the workers of iniquity shall fall. They shall be cast down and shall not be able to rise. With purity will the Lord thy God arm thee, and purity and truth shalt thou teach. Keep the law of te Lord thy God in thy heart, and none of thy steps shall slide. With thee is the fountain of truth. In thy light shall the people of thy God see, for thou shalt speak his word unto them, and from thy lips shall they receive it. The blessing of their God shalt thou put upon them, and his curse upon evil doers; if, after being oft rebuked, they repent not; and before my people shalt thou go to lead them, unto my ways, for unto thee has the Lord thy God given salvation. cessor of Joseph Smith to the prophetic office, that where ever presented to establish the claims of any man since the world began. First, observe on the 18th day of June, the very day that God inspires Joseph Smith to write and appoint James J. Strang, Mr. Strang has an open vision; again, on the 27th of June, at five and a half o’clock, the very hour and moment that Joseph Smith sealed his testimony with his blood, in Carthage jail, and before Mr. Strang had received the letter of appointment, God sends an holy angel, a heavenly messenger, from the world of most excellent glory, clothed with power and authority and confirms the appointment, and ordains him as his successor; not leaving the church one moment without a head, who is a prophet, a seer, a revelator, and a translator unto the church of Jesus Christ of the Latter Day Saints. THE SMITH FAMILY.–Mrs. Emma Smith, widow of the mar. yred prophet, her three sons Joseph, Frederic and Alexander, and Mrs. Lucy, the aged mother of Joseph Smith, together with his three sisters and their husbands, and William, his only surviving brother, all acknowledge and advocate the claims of James J. Strang as the successor of Joseph Smith to the first presidency of the church. We inert the following from the Voree Herald. I have, since I returned to Nauvoo last, for the first time been aprised of an appointment made by Joseph Smith to James J. Strang. In hearing this, I took pains to gather all the evidence that could be adduced, to see if there was any foundation at all for the claims of Mr. Strang. I called in to see sister Emma, to enquire concerning the appointment. Sister Emma says that Joseph received a letter from Mr. Strang, Hyrum was present, and he called in brother J. P. Green; at first Joseph thought all was not right, but Hyrum thought otherwise. They talked over matters awhile and came to the conclusion that Joseph would write a letter; so Joseph and brother Green went out for that purpose. Emma also states that her son Joseph saw a woman come into a room in Far West, Missouri, and told him, this church would go to voree; the boy was only eight years old; Joseph, his father, was in jail at the time; the boy remembers the vision, &c. Joseph before he was nartyred, when on his way from the temple hill, hone, saw a vision, and his mother recollects that when he came home, he put his hands upon his eyes, and prayed that the vision might pass, and that he stated he heard, as it were, music in the heavens, but the notes were low and sad as though they sounded the requiem of martyred prophets. I remember myself that Joseph said: “My work is almost done, I feel that I shall rule a mighty host, but not in this world; the wolves are on the scent,” &c. Joseph bid his wife and mother farewell, sayng “I am going as a lamb to the slaughter,” this was his impression. And I further state that Joseph did not appoint the twelve as his sucessors, and I was in the last counsel with him, and had an opporunity of knowing and hearing his sentiments in regard to these things. I also heard Joseph say, “that should the time ever come that Brigham Young and Heber C. Kimball would lead this church, that they would lead it to hell,” This was said in the hearing of sister Emina Smith. 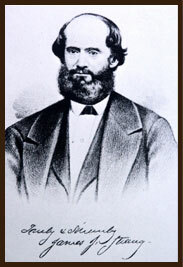 The whole Smith family of the Joseph stock join in sustaining James J. Strang. It is to be remembered that soon after Joseph and Hyrum’s death, brother Green died: and he was heard by numerous individuals to say, that Joseph had appointed Strang. This is to certify that the Smith family do believe in the appointment of James J. Strang. WILLIAM SMITH, LUCY SMITH, Patriarch. Mother in Israel.